The Gavita Pro 300 LEP produces light with an extreme high CRI of 94. 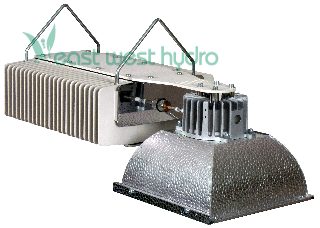 It can be used for simulation of sunlight conditions in climate rooms (41.02 emitter), to provide additional spectrum lighting in greenhouses when there is not enough natural sunlight available to complement HPS. The Gavita Pro 300 LEP is a solid state horticultural plasma light fixture. There are no moving parts in the fully sealed housing, improving the reliability. The glass wide spectrum filter allows for low quantities UVA and UVB light to pass while shielding you and your crop form UVC. The MIRO aluminum reflector delivers an even square light pattern. Housing sealed with Gor-Tex ventilation plug. Coverage area at 1' distance is 3' x 3' and at 1' 4" distance is a 4' x 4' coverage area. The Gavita Pro 300 LEP produces light with a spectrum similar to that of the sun. The full light spectrum even includes UVB. The Gavita Pro 300 LEP is a solid state horticultural plasma light fixture. There are no moving parts in the fully sealed housing, improving reliability. 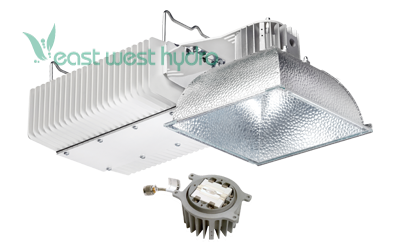 The light source is a LUXIM STA 41.01 LiFi module which has an average life of 50,000 hours. The Miro Aluminum reflector generates an even square light pattern. Comes with high quality glass filter. Housing sealed with Gor-Tex ventilation plug. Coverage area at 1' distance is 3' x 3' and at 1' 4" distance is a 4' x 4' coverage area. 906055 has 17,000 lumens, 300 micro-Mol/sec, 30,000 hours lamp life and 5600K color that has a higher red content, light source is a LUXIM STA 41.02 LiFi module. 906070 has 21,000 lumens, 310 micro-Mol/sec, 50,000 hours lamp life and 5750K color that has a higher blue content, light source is a LUXIM STA 41.01 LiFi module. 16' cord with Wieland RST and NEMA 6-15 plug. Fixture dimensions: 23.3" long x 10.3" wide x 7.5" high. Dimensions: 24in. × 11.2in. × 8in.